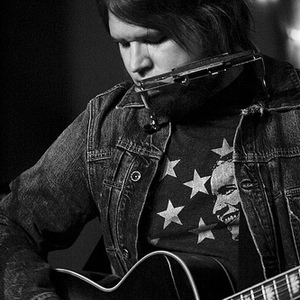 Israel Nash Gripka is an American acoustic / folk-rock singer-songwriter currently based in New York. From the Ozark Mountains of the Missouri countryside to the concrete jungles of New York City, Israel Nash Gripka presents a musical tradition that reveals both the American fabric and all that rests beneath those weathered and faded blankets of stars and stripes. In an almost conflicted manner, Gripka uses his upbringing as the son of a southern Baptist minister to contrasts the realities of his life. In an almost conflicted manner, Gripka uses his upbringing as the son of a southern Baptist minister to contrasts the realities of his life. From drinking to praying, from churches to county jails, and from sorrow to revival, his songs are stories and reflections that serve to kick like classic Rock N' Roll all while pining with the heart of Americana roots, complete with undertones of soul trampled country, and gospel choirs. His debut release, New York Town (2009) helped to garner fans in both the U.S. and throughout Europe. With world wide accolades, multiple tours in both regions of the world and growing recognition as a songwriter's songwriter, Gripka set out to write new songs, with new sounds, new ideas, and new people. In an attempt to escape those fore mentioned jungles of New York City, Israel sought the taciturn fields of the once familiar countryside. In the heart of an old and dusty hay barn, nestled deep in the Catskill Mountains, Gripka, along with co-producer/drummer Steve Shelley (Sonic Youth) and a group of friends, created his anticipated follow up, Barn Doors and Concrete Floors (2011). The vision was to have a studio that wasn't a studio at all. To capture sounds that no other place could create. To throw away clocks and avoid set hours. To eat around a big table for dinner and sit around a warm fire pit at night. In short, the idea was to create an environment where nothing else really mattered except the gathering of friends making music in the simplest of settings. The 11 track record plays like a vinyl relic stored in the belly of your father's basement. You put it on, you flip it, flip it again, and then once more the first time you pry it from the onion sleeve. When artists make records that are unencumbered by regimented schedules, turn off contact from the outside world, and isolate themselves in the arms of the country, you hear it and you hear it loud and clear on Barn Doors & Concrete Floors.